I became interested in gaming the Portuguese Colonial Wars a couple of years ago when my company sent me to Lisbon, Portugal to work on a software project. There was an older fellow in the office, and one day, when several of us went to lunch, he mentioned to me that he fought in Mozambique during the wars. Up to that time, I was largely ignorant of that segment of history, so I read up a bit on it, and eventually decided I wanted to play out the period on the tabletop. This force was originally designed to play with AK-47 Republic rules, but later I expanded it a bit so that I can also use it with Cold War Commander rules also. If you’re familiar with the AK-47 rules, you know it’s not meant as a strictly accurate treatment of history, but more as a loose, fun game. Because of that, I made a few choices that fit with the game but maybe weren’t so accurate in terms of what actually took place. I’m ok with that, and I designed the Cold War Commander force to be a bit more true to history, at least according to what I could find out. 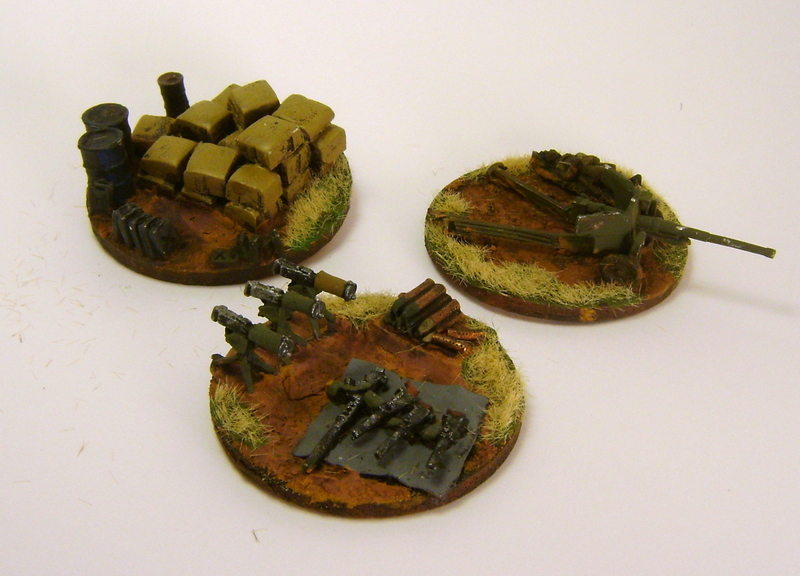 Next are some heavy weapons for the troops. 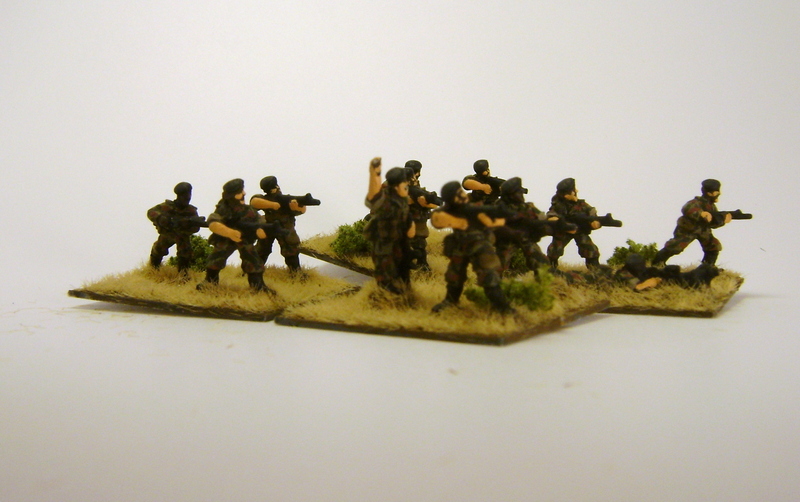 I used some extra figures I had lying around the spare parts box for the mortar teams (Old Glory and QRF, I think). Yes, those are German heavy machine guns you see there. The Portuguese had a license-built copy of the MG-42, which they used right up to the end of the Colonial Wars in 1975. 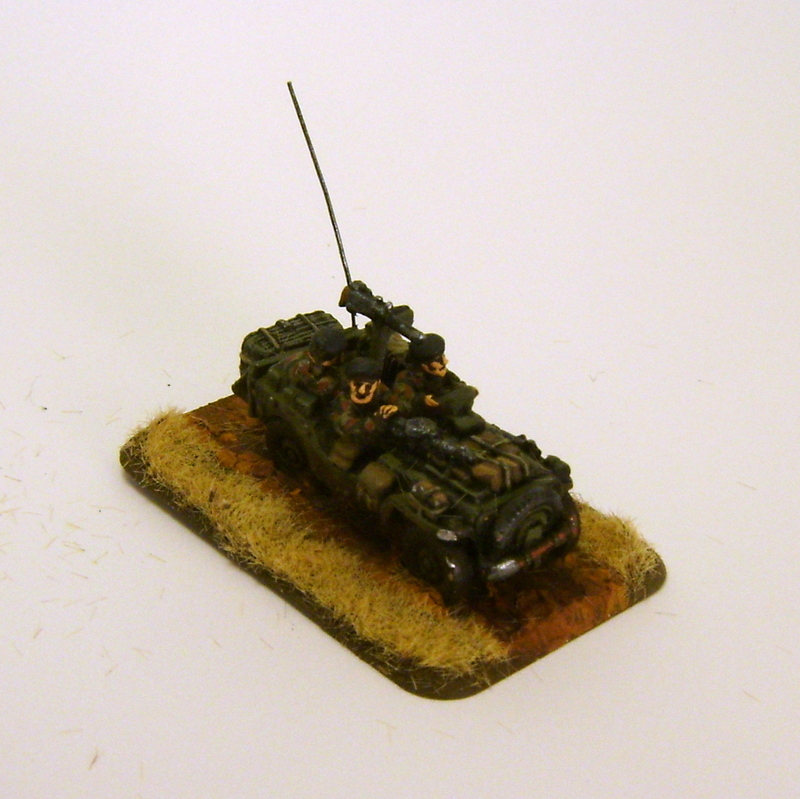 Here’s a jeep for the Fuzileiros which can be used in game as a reconnaissance unit, mobile gun platform, or a simple transport. 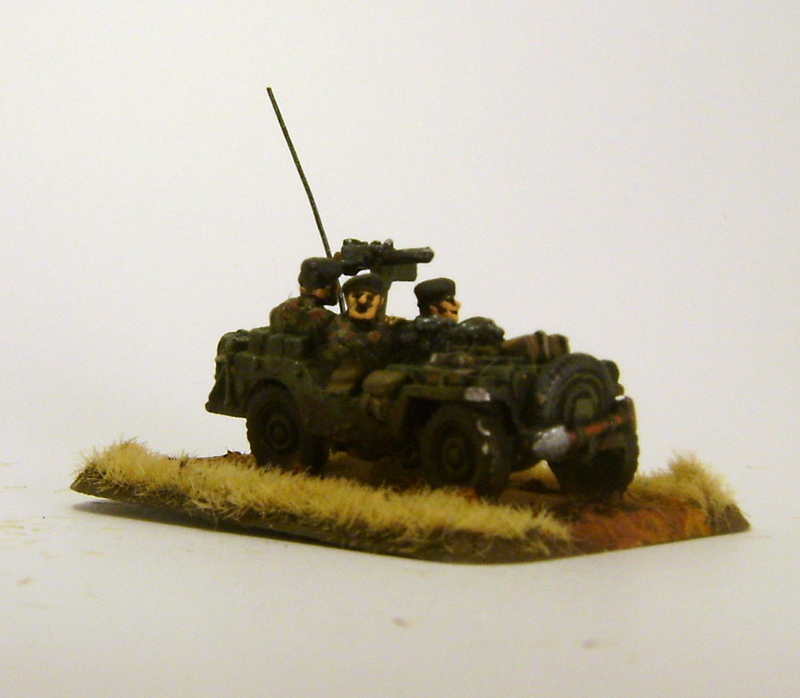 The Portuguese used quite a few jeeps, especially in the earlier period, but i’m not entirely sure they used them in the way I am with my game army. This is essentially just a Peter Pig WWII British airborne jeep built almost straight from the package. The heads of the crew are separate, so I went with the beret-wearing heads instead of the helmeted ones, and then painted them in Fuzileiro colors. I also added a thin wire for the radio. The Portuguese really went for armored cars in a big way, and they used them a lot in Africa. They had a wide variety of different types, from old British WWII scout cars to sleek, modern French ones. They also had some fairly bizarre-looking field-modified vehicles. I would have loved to do several different vehicles, but I decided to give my guys some French AML-90s. I have always loved the way the AML-90 looks, and it packs a powerful gun. To move troops around, the Portuguese relied on a variety of transports, both armored and unarmored. The truck was the most common type of transport vehicle. In the beginning of the period, they mostly used American jeeps and trucks, but as the wars continued, they began to use European-made UNIMOGs. 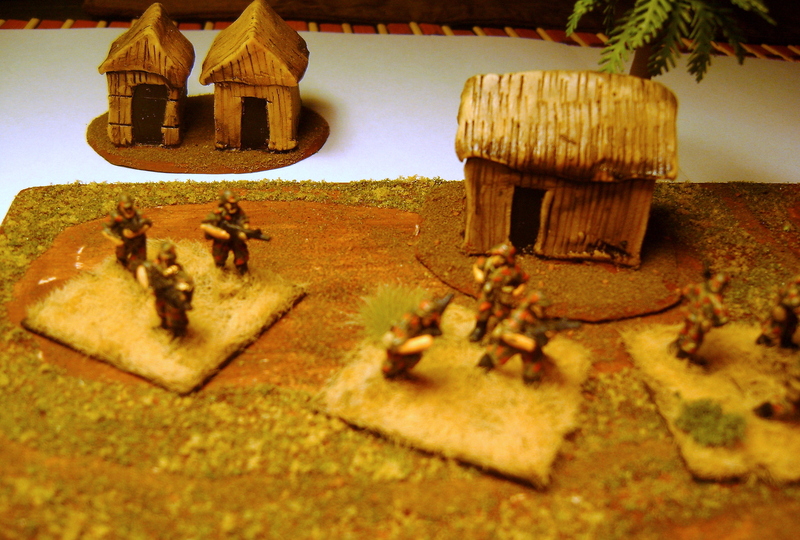 I decided to give my troops the UNIMOGs also, but made some slight modifications. The Portuguese preferred their troop transports to be flatbeds with what looked like a park bench arrangement mounted on the back. The thinking behind this was that the men could deploy more rapidly if they came under fire. 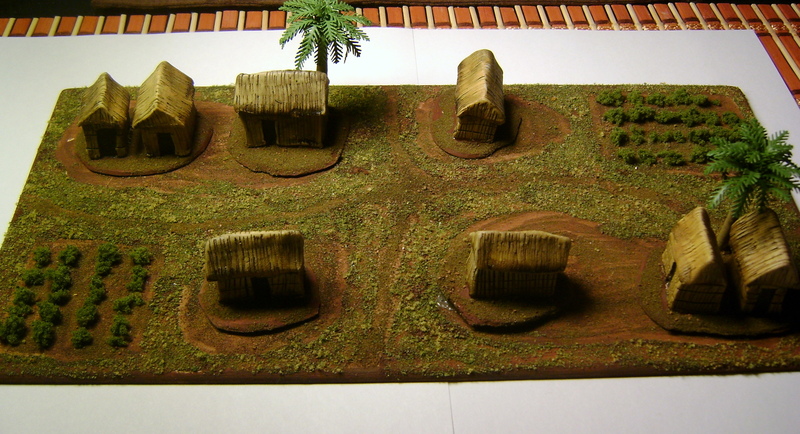 I made the buildings out of Sculpey clay, and they were super-simple to make. The template is a sheet of thin plywood with a bit of flocking attached. I would like to post additional Portuguese units in the future, as well as their guerrilla opponents, so keep an eye out. 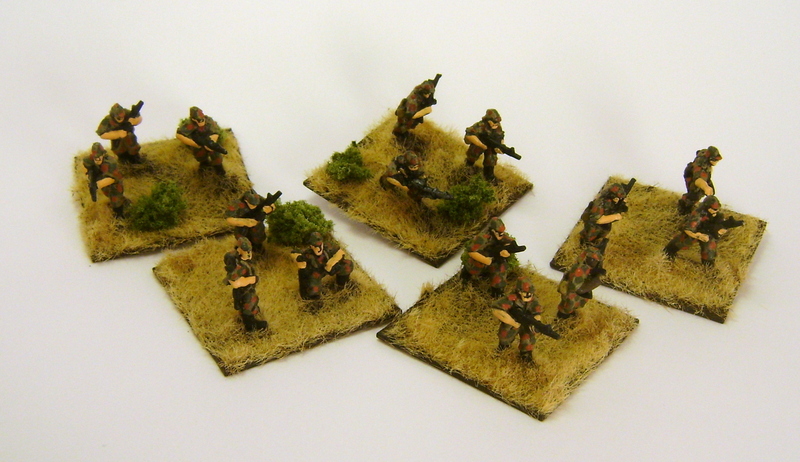 Thanks for this, I am doing the period, although in 28mm, and this gives me some ideas. Here is a link if you want a look. Thanks for the comment! Those are some great looking figures, Mac. 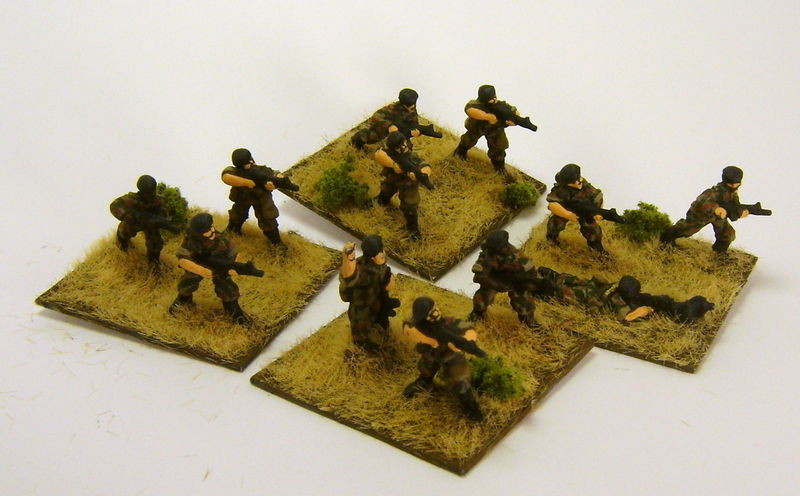 In fact, 28mm is my favorite scale, and I’d love to finally find Portuguese figures in that scale. It’s just a fascinating period. And seem to be landing on CWC as the rules. Wondered if you’ve any insights. I think everyone has their own opinions about which rules are best, but I really like CWC and would highly recommend it. I think it’s a very flexible set, especially in terms of creating your own army lists. Also, I find the forum very helpful and supportive.